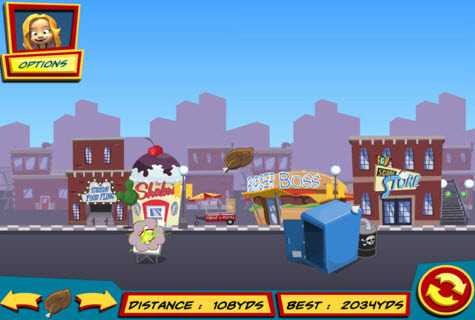 Director of Production, Electron Buttski 2, talks about FunGoPlay’s new Football Flinger App! Krunchy Hotsauce 1: Hi, Electron Buttski 2! Can you tell us a little bit about your role at FunGoPlay? Electron Buttski 2: I’d be glad to! I’m the Director of Production here at FunGoPlay, which means that I help manage the production team as they work on all of the content that’s going to go into the FunGoPlay world–so everything from new world areas to games to assets for your FunGoPlayer. We have a really talented team of folks working to make FunGoPlay the best it can be, and it’s a lot of fun! Krunchy Hotsauce 1: Awesome!! How did the creation of the new Football Flinger app come about? Krunchy Hotsauce 1: haha I can’t wait to play it! What is your favorite item to fling? Electron Buttski 2: Wow, that’s a tough one, there are 14 flingable items, with more on the way in the future, so it’s hard to pick…BUT I’d have to say my favorite is the Rocket Ball! Krunchy Hotsauce 1: Nice!! 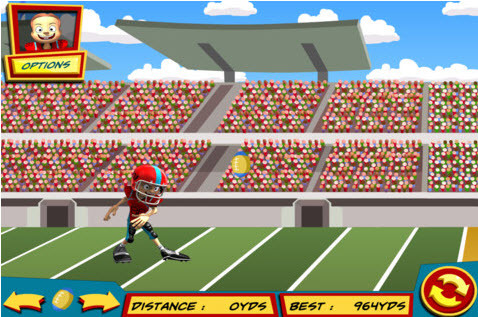 It seems like Football Flinger is gaining popularity very quickly! Are there any upcoming specials or features in the app that you can share with us? Electron Buttski 2: We recently made an update available that has some minor tweaks and improvements to the game, so be sure to download that, and we’re also working on a version that will feature more levels, more footballs and more flinging than ever before! Krunchy Hotsauce 1: Word! Ok, last question.. if you could be an ice cream, which flavor would you be and why? Electron Buttski 2: Raspberry & dark chocolate, because it’s the greatest ice cream of all time–there’s simply no room for debate! Krunchy Hotsauce 1: YUM!! Electron Buttski 2, thanks so much for your time today!! And thanks for all you do to make FunGoPlay such an awesome experience! Electron Buttski 2: Aww shucks, like I said, it takes a great team to make FunGoPlay fun to play! 🙂 Thanks, it was fun! Posted by fungoplay on February 14, 2012 in General.